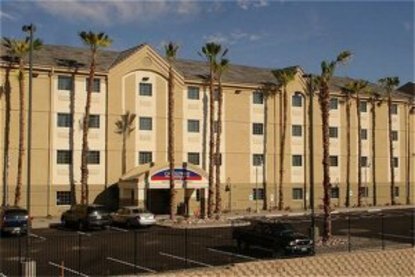 The Candlewood Suites Yuma, Arizona represents the premier extended stay hotel in Yuma. Opened in December 2007, the brand new Candlewood Suites features 95 professionally decorated units complete with all of the comforts of home. Each unit includes a fully equipped kitchen complete with a full-size refrigerator w/ice maker, a cook-top stove, dishwasher, microwave, garbage disposal, cookware, and dinnerware. Every guest room at the Candlewood Suites also has an executive desk with ergonomic chair, large leather recliner and a 32&reg LCD flat-screen television. The new Comforts of Home&reg Bedding Collection provides what can only be described as Yuma&regs best sleep experience. Free high-speed internet access is available in every guest room, as well as in the business center adjacent to the lobby. The DVD player in every guest room can be used to watch any of the free movies available from the lending library at the front desk. The Candlewood Cupboard convenience store off of the lobby provides a large selection of snacks, as well as meal items that can be prepared in the comfort of your own room. For those looking to really do some cooking, there are three stainless steel Jenn-Air gas barbeque's available outside, next to the signature Gazebo. The Candlewood Suites &reg Yuma also features complimentary access to washers and dryers when it&regs time to do the laundry. The basketball sports court and fitness center provide a great way to de-stress at the end of the day. This hotel is committed to providing accessible facilities under the American Disabilities Act. If your accessibility needs are not met, please contact the Hotel Manager on Duty. Should you require additional information regarding accessible facilities for guests with disabilities, please call 1-800-Holiday (U.S. and Canada) or contact the hotel directly. For the hearing impaired, TDD service is available at 1-800-238-5544 within the U.S. and Canada.